A few months ago, one of my daughters sent me a recipe she found in the Martha Stewart publication Everyday Food. She said it was great and gave me her variation on the recipe. I tried it a few weeks later and made a few changes of my own, like using ground beef instead of the shredded chicken that my daughter used. The original recipe had no meat at all. A month later, my other daughter decided to try it and made a few more changes. Recipe sharing is a bit like playing “Telephone”. Each person makes minor changes due to ingredient availability or personal preference and, it the recipe travels through the kitchen grapevine long enough, it eventually bears little resemblance to the original. In a medium bowl, combine beans, cornmeal, 1/2 cup cheese, remaining onions, minced garlic, cumin, and 3/4 cup water; season with salt and pepper. The first altered version added some shredded cooked chicken to the cheese and black bean filling. Not being a great fan of black beans, Daughter #1 used only half as many as called for. She also only used 1 onion and 1 garlic clove in the sauce but she used 2 cups of cheese instead of 1 cup. My version was to use ground chuck, browned first with one of the onions, then mixed with the beans and cheese. I didn’t use the cornmeal at all. Daughter #2 made a number of changes. For the sauce, she merely opened 3 cans – one of Rotel tomatoes, one of red enchilada sauce, and one of tomato sauce. 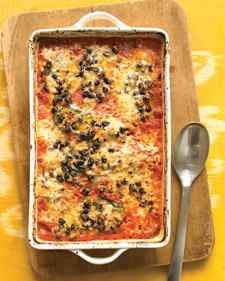 She used a combo of ground chuck and chorizo, adding a lot to the spiciness of the dish. She wasn’t sure what kind of peppers she used, probably banana peppers – they were light green longish peppers. Brilliantly inspired, Daughter #2 made a garnish, using black beans, chopped red pepper, purple onion, and cilantro. This sprinkled on top of the cooked poblano’s not only made them beautiful, but added the finishing taste touch, along with a dollop of sour cream. When I want a more hearty version of the originals, all three of them, I will use Daughter #2 version, presented below in her words. about 8-10 large/long light green peppers, stem and top cut off and ribs and seeds removed. 0. Preheat oven to 425 degrees Fahrenheit. 1. Saute ground chuck and chorizo until done; pour off grease. 2. While meat is cooking, mix up sauce and pour into a 8 1/2 x 11 pan. Also chop up ingredients for stuffing. 3. Mix meat in with the rest of the stuffing ingredients. 4. Stuff peppers — really stuff it in there, use a fork to push it down. 5. Lay peppers in pan; if there is any remaining stuffing mixture, just sprinkle over the peppers. Ladle sauce over the top of the peppers and top with remaining grated cheese, about 1/2 cup. 6. Cover with foil and bake 45 min at 425. 7. Uncover and bake another 10-15 min until cheese is browned and sauce slightly thickened. I love autumn. I was driving through the country today. The sun was bright, the sky was beautifully blue, and the trees were beautiful. I wanted to pick apples, choose pumpkins, carve jack-o’-lanterns, wear a sweater and jeans (even though it was 75 degrees Fahrenheit), and go to an Oktoberfest. Love the food. German potato salad, cabbage, pork, sausages…. I came home, mouth watering, to a bologna sandwich. Oh well. In a few days, I’ll get cracking on the Oktoberfest goodies. I’ll try to find my favorite recipes and share them with you. To get started, try this one. It has sausage, onions, apples, and other stuff, but the beautiful reddish purple cabbage is the base for the entire concoction and it’s beautiful, and healthful, color invigorates the one who consumes it. Wow. That sounds profound, almost. Red cabbage is one of those vegetables whose brilliant color lets you know it’s full of valuable nutrients. Keep a head of it on hand (it keeps a long time) and cook half of it and use the other half shredded in tossed salads if you like. I don’t remember the source of this recipe. It’s possible that it is a combination of several that I have tried. I generally don’t pay too much attention to the amounts of the seasonings in this. You may not have a jar of juniper berries on hand. It’s really essential in this dish. Spring for it. It will keep in your cupboard for ages. 2. Saute onion in butter until translucent and tender. Add the cabbage and cook three minutes or until just tender. 3. Add the rest of the ingredients, except for the sausage. Stir to mix well. 4. Cover, cook ten minutes. 5. Transfer to a gratin or other shallow baking dish. Place the sausage over the cabbage, split side up. Are you still able to get fresh green beans at your local farmers’ markets? Sometimes the ones in the grocery stores are okay, but the best ones are so fresh you can practically see the dew still on them. 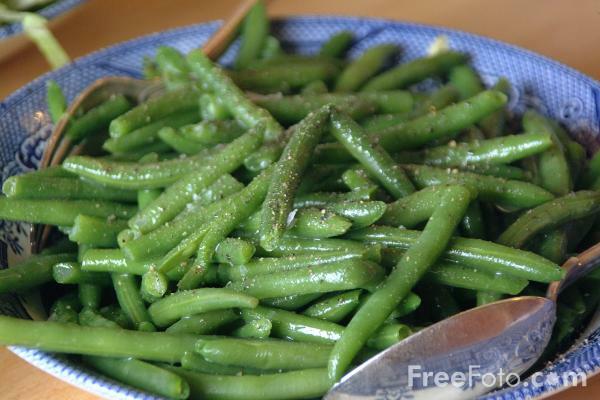 Here’s an easy and extremely tasty recipe to take advantage of the last of nature’s green bean bounty. The only special things you need are bacon, some pearl onions, dried thyme and cider vinegar. These aren’t really “special”, but not everyone craves bacon and vinegar like we do. After all, you can’t have too much bacon – my brother-in-law’s personal motto. For the pearl onions, you have a choice of three. Fresh whole pearl onions (which you will need to parboil and peel), frozen pearl onions (which you will need to thaw), or a jar of cocktail onions (which you will need to drain). I try to keep a jar of these handy as well as a bag of frozen ones. Personally, I dislike peeling the tiny ones. I know all the tips. But it’s still sometimes a sticking point when I’m deciding whether or not to try a specific recipe that calls for fresh ones. Anyway, the cocktail onions have a special tang which adds to this dish so if that floats your boat, use them. 1. Cook beans four minutes in boiling water. Rinse with cold water. Drain and pat dry. 2. Cook bacon in a large nonstick skillet until crisp. Remove from pan. Keep two tablespoons of drippins in the skillet and discard the rest. Crumble bacon and set aside. 3. Add onions to pan. Cook three minutes if using previously frozen onions, one minute to warm the bottled ones. Add sugar and thyme. Cook three minutes, till golden brown. 4. Add the green beans to the pan. Cook two minutes, stirring. Add vinegar and salt and pepper. Toss well to coat. 5. Add bacon bits and serve. While planning a small dinner party celebrating a good friend’s birthday, I wanted to simplify the last minute preparations as much as possible. I enjoy having this wonderful couple with us for dinner and didn’t want to be a jack-in-the-box cook, popping up and down in the middle of conversations. A little of that is unavoidable in this day and age. Few of us have cooks, or maids, or butlers handling household duties and I’m not sure I would want that anyway. Deciding on the menu was relatively easy. I knew I wanted to serve beef tenderloin, either as a roast or as steaks. Some potatoes, a vegetable, and a salad would make it a very traditional meal, and one I knew we all would enjoy. I had bought a half-peck of apples and wanted to make an apple crisp. (By the way, a peck is a quarter of a bushel, so half of that would be an eighth of a bushel, or 8 pints, dry measure.) Broccoli would serve for the vegetable, mainly because I had a huge amount on hand, having received two bunches the day before from my CSA (Community Sponsored Agriculture) delivery. I also had a lot of fresh salad greens from the delivery. I bought a whole tenderloin and trimmed it and cut it up into several different pieces. It was nearly five pounds intact. I wound up with a nice size piece to roast, about a pound and a half. I also was able to get three moderately small filets weighing about 11 ounces total, and nearly a pound and a half of beef for stir frying or sauteing. The scraps will be used for flavoring soups, etc. Everything except the roast is being stored in the freezer. The price of the whole tenderloin is nearly what I would have paid for just four filets at the meat market. Of course it took a while to do all the trimming. I’m not as fast as a butcher but then I don’t prepare tenderloins everyday, darn it. The Barefoot Contessa provided the perfect recipe for the tenderloin. With the meat at room temperature, I rubbed the surface with butter and seasoned it with salt and pepper generously. It roasted on a baking sheet in a 500 degree oven, yes, five hundred degrees Fahrenheit, for 25 minutes for medium rare. Then I wrapped it tightly in a double thick piece of foil and let it rest for 20 minutes. I will certainly use this method for all future tenderloin roasts. It was perfectly cooked, nicely browned, still juicy, and very tender. Remember to tie the roast with kitchen twine every two inches to keep the shape uniform. Luckily for me, I have three nice slices leftover from last night! The broccoli was steamed and served as it was, no sauce, no lemon. Plain. The unadorned slightly bitter flavor was a nice complement to the rest of the meal. I called on the Barefoot Contessa again for her apple crisp recipe. *** It had the zest of an orange and of a lemon in it. That adds pizzazz to the old-fashioned dessert that we all enjoyed with a scoop of vanilla ice cream. All in all, it was a very good dinner, with few interruptions from the kitchen. The apple crisp was made in the afternoon and sat ready to go on the kitchen counter. The potatoes, assembled a little before the guests arrived and already in the oven, needed no tending and neither did the beef. The broccoli was in the steamer ready to steam during the last few minutes. I was very pleased with the flow of the food preparation. It helps me to have a small chart in the kitchen showing required temperatures and times for the various dishes. I then calculate approximately when each activity should take place and list everything in chronological order. I can check off each chore as I accomplish it. That way I don’t have to remember everything. I carry my little clip-on timer with me if I need to go outside, as we did last night to sit on the patio and enjoy the perfect fall weather before dinner. 1. Heat oil in a medium heavy bottomed pan. Add shallots and saute over medium-low heat, stirring frequently. Add the thyme, salt and pepper, and cook for a few minutes until the shallots are tender. Then add the garlic and stir for 30 seconds or so. Add the flour and stir constantly while cooking the raw taste from the flour, about 1 – 2 minutes. 2. Add 1 cup of milk and whisk into the flour/shallot mixture. Continue cooking over medium-low heat until thick. Add cream if desired and nutmeg. Remove from heat. 3. Bring a large pan of salted water to a boil. Peel the potatoes and cut into 1/4-inch slices. Try to make them as uniform as possible. It’s important to not get them too thin or they will break apart while boiling. Add to the boiling water and cook for 5 minutes after the water returns to a boil. Drain the potatoes well in a colander. 4. If baking immediately, preheat oven to 425. Butter a gratin dish or other 2 to 2 1/2 quart baking dish. 5. Arrange half of the potatoes in the casserole and season with salt and pepper. Put half of the goat cheese on the potatoes and pour half of the cream sauce on top. Repeat the layers and dot with the butter. Sprinkle with a little more nutmeg if desired. 1. In a glass jar with a lid, shake the vinegar, salt and pepper and garlic together. 2. Add the mustard and mayo and shake again. 3. Add the rest of the ingredients and shake well. 4. Store in the refrigerator for a week. Preheat the oven to 350 degrees F. Butter a 9 by 14 by 2-inch oval baking dish.Peel, core, and cut the apples into large wedges. Combine the apples with the zests, juices, sugar, and spices. Pour into the dish.